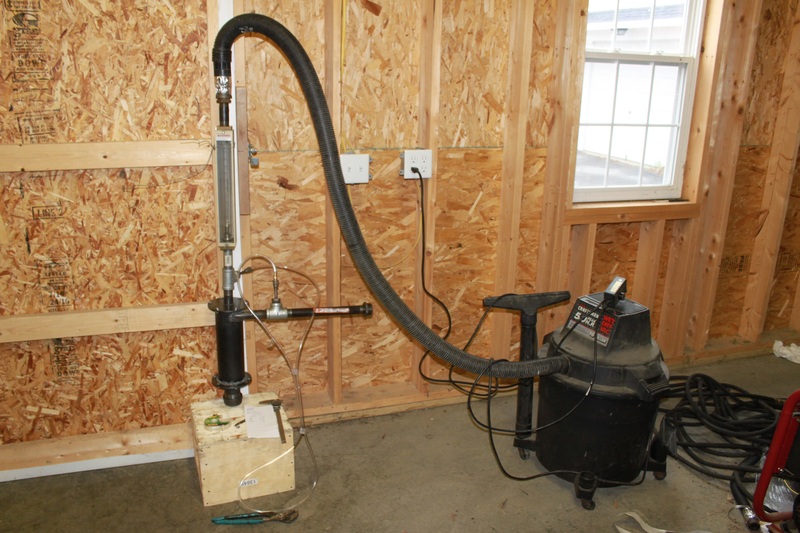 A cyclone filter should be the first level of filtration in any wood gas system. A typical cyclone will remove over 90% of the particulate matter from the gas stream. IT WILL NOT REMOVE TAR UNLESS THE TAR HAS CONDENSED INTO DROPLETS. 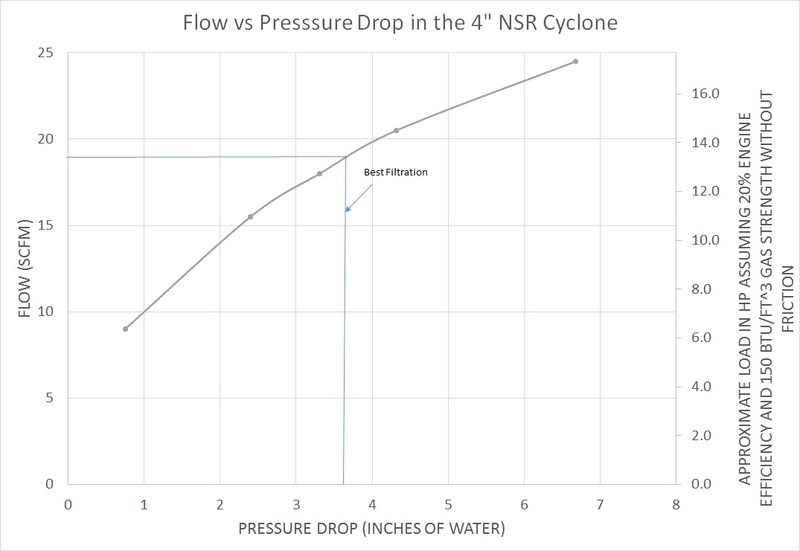 The “squared” term indicates that the filtration will improve dramatically as the cyclone flow increases. If you actually do the math you will find that the force on a particle is over 300 times that of gravity at the point of best filtration. This is why I advocate cyclones over settling bins. Settling bins only apply a single force of gravity. The cyclone actually has two “tornados” inside. There is an inner and an outer vortex. Any dirt that gets blown into the inner vortex is immediately thrown back into the outer vortex which is why these units are so effective. If you would like to purchase a wood gas cyclone filter, I do build and sell them. Please see the Get Hardware drop down list. I drew in a “best filtration” line strictly based on the 1D3D style cyclone numbers. There is NO testing behind that line. I will try to get to that later but I just have more important things to do first. 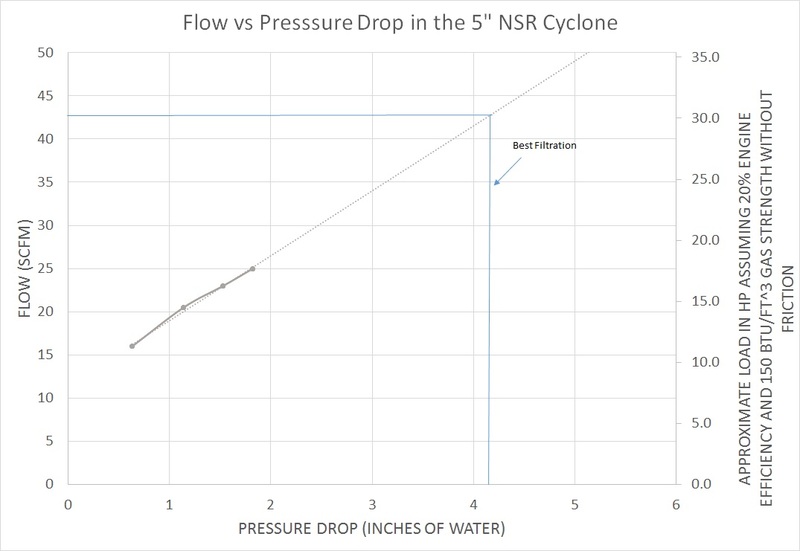 Now if you have purchased one of my cyclones and you would like to know the gas flow in your system you can determine it by simply reading the pressure drop across the device with a manometer. Lastly, my flowmeter only goes to 25scfm which is why I have to project such an uncomfortably large amount. Should not the shape of the cyclone be more of “funnel” shape? I have much experience with cyclones/filtering systems such as baghouse filtering used in the plastics molding industry-mainly air filtration from large granulators used in grinding plastic materials into a useable size for reuse in injection molding machinery,etc. 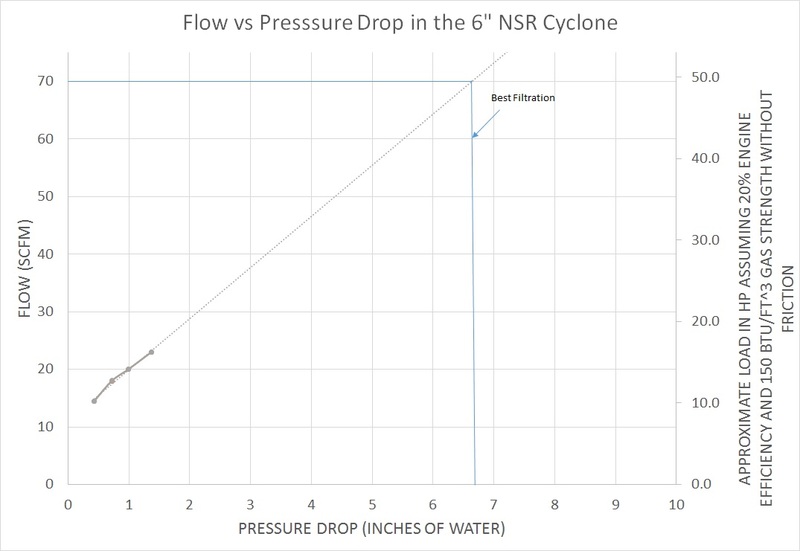 Idea being the dirty air enters side of cyclone’s top end (largest diameter of cyclone)-air swirls around-as airstream drops downward inside of cyclone to smaller diameter the velocity increases thus increasing centrifigal force effect on particles (seperation)-particles/dust fall down to bottom of cyclone-where in a continous use operation-fall into an “airlock” rotating bucket that then drops particles (fines) into a hopper,etc. I have worked on systems having 2 blowers-one before and one after the cyclone-blowers had to be “balanced” in workload for optimal operation. Randy…No question..a conical bottom unit is better when it is run at a constant optimal flow rate. A 1D3D run at 3000ft/min will get better than 99% if the particles are large enough. However! My cyclones run 92-94% efficient at 1/3 the fabrication cost. Running them both off their optimal flow point would likely make them darn similar. The REALLY important thing is that I have never seen dirt in my final filter. That means it is good enough even with the simplified construction. I do see soot, moisture and start up tars in the final filter. I am not trying to imply it is perfectly clean.